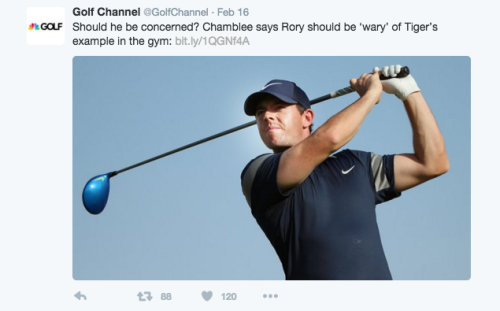 You might not think of professional golfers focusing much of their time on the gym. Only recently have we seen the younger wave of golfers spend a lot more time focusing on that aspect of their game. Stronger bodies mean longer drives. PGA TOUR pro Rory McIlroy REALLY likes to work out. Here’s one from a recent shoot with Men’s Health. Rory was benched for a while in 2015 with a ligament injury. But he’s back this season, both on the course and in the gym. In fact, last week at the Northern Trust Open, Rory had a little fun and caused a small social firestorm in response to the media saying he spends too much time at the gym. On Tuesday, Golf Channel’s Brandel Chamblee expressed concern over McIlroy’s gym time, insinuating it could lead to a “destructive path” that took down Tiger Woods. Rory responded with a short video, squashing any doubt about his fitness prowess. And though he’s one of the fittest guys on TOUR, he knows his limits.